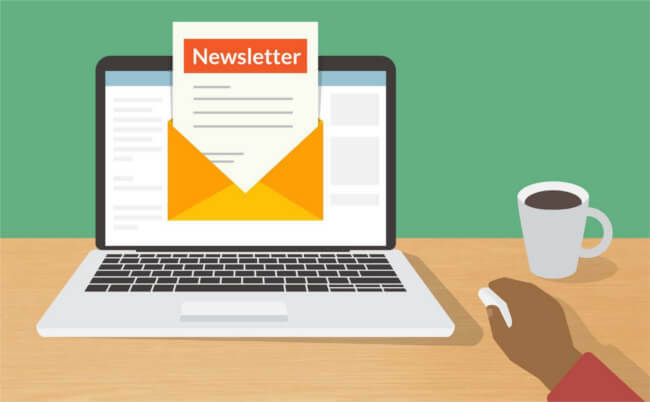 This article will take a look at the various reasons why businesses should use newsletters as part of their marketing strategy, how to get started with your very first newsletter and how you can use feedback surveys within your newsletters to create added value for your audience. Boost awareness: Newsletters can be a great tool for spreading the word to customers and prospects about what you have to offer, how your business operates and what kinds of developments are taking place. Get more business from existing customers: Serves as a portal for sharing the latest updates and advancements in products / services with your existing customers. You can clearly show the benefit of, for example, a new product without being too pushy. Educate your prospects: Provides prospects with valuable information to help them make purchasing decisions. Build up your contact list: Offer visitors a free subscription to your newsletter in exchange for their email address. This is a great way of getting their details for sales purposes. Drive traffic on your website: Send out links to articles or announcements from your blog via your newsletter to get visitors wandering around on your website. Add value to your product / services: Newsletters can be a great way of offering customers or prospects special offers such as discounts or deals on packages or services. Unfortunately, there is no universal ‘perfect time’ to send out a newsletter. And for that reason, timing is actually very company-specific. 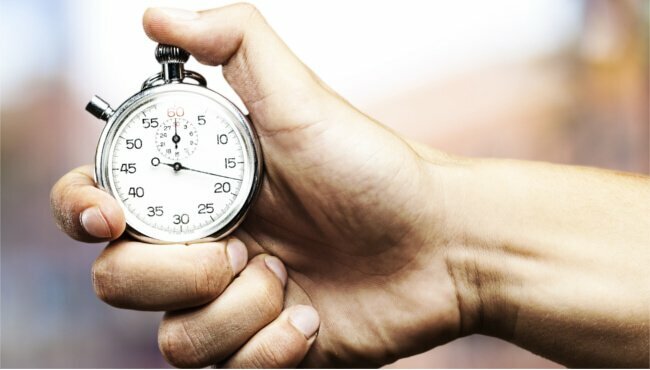 To determine which time is best for your business, it’s helpful to consider these four factors: your own workflow, your audience, what your competition is doing and your business’ goals. With workflow, I am referring to a time / date that suits you best. For most marketers, it’s easiest to choose a set time that you can work with each day, week or month (depending on the frequency of your newsletter) and that you can be consistent with. This consistency will give your newsletter a better chance in becoming a routine read for your audience. Your audience is the next factor you should take into account. 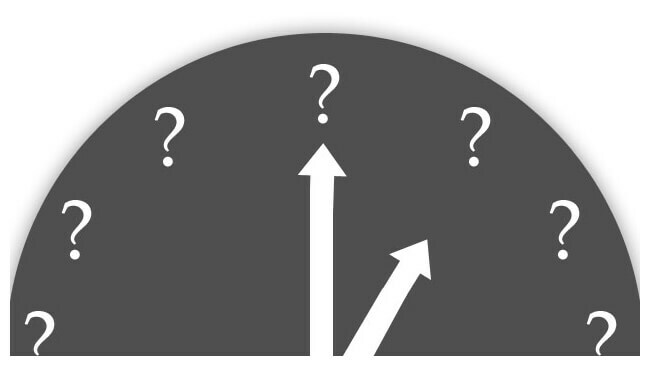 Try to picture which days of the week or times of day your audience is most likely to open your newsletter. This can be tricky but sending your newsletter at just the right time can make all the difference. And what are your competitors doing all the while? Whatever they’re doing, don’t sync your efforts with theirs. Aim to be the only new newsletter in their inbox. Lastly, think of the goals you have with your newsletter. For example, if you send out a link to a really long article, it’s probably not ideal to send it out in the morning before work when most readers don’t have time to read 2000 words. As an alternative, trying sending it out over the weekend. If you prefer to have more guidance, however, you can try following the tips in this guide. In terms of the design of your newsletter, there are also several important factors to keep in mind. These include mobile readability, the length of texts (and breakdown of paragraphs), image sizes (larger images may take longer to load) and font usage. For a good list of design tips, click here. Subject lines are critical in email marketing. They are the first impression your reader will have of your newsletter and may determine when they click to open or delete the email. The subject line has to be intriguing as well as informative for your readers. Here are some tips on how to write a catchy subject line. 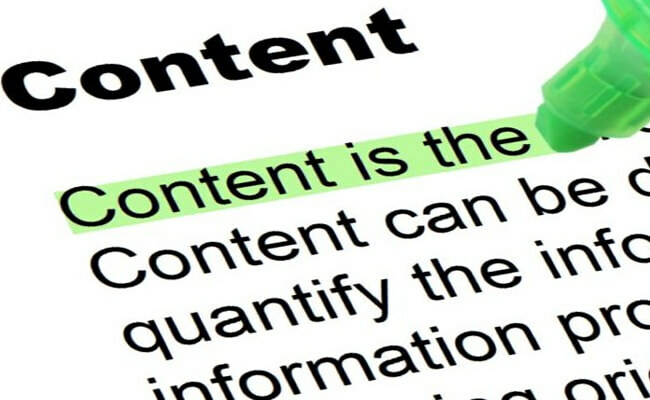 It’s important to pick and choose content that you know will have value for your readers. In terms of articles, start with your best foot forward. In other words, choose articles that are read-worthy and relevant to your audience. 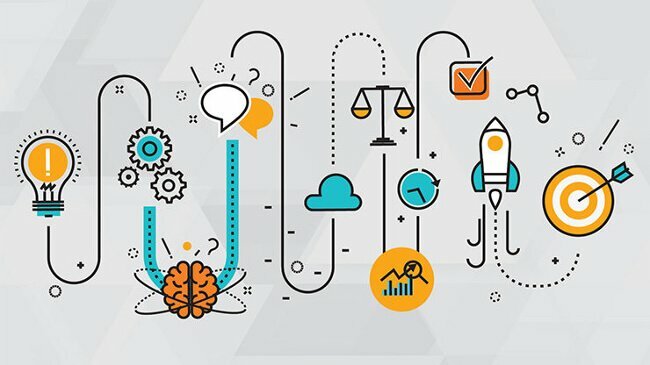 If you have new product releases or market updates, you might also want to incorporate these as they show your readers that you are innovative and moving forward while simultaneously showing that you want to keep them educated on more general subject matter. It might also be helpful to include exclusive offers or discounts to keep readers engaged. Now in order to improve your efforts, you have to test your efforts. It’s time to monitor the performance of your newsletter. After all, most businesses that struggle with newsletters (and email marketing as a whole) can often attribute their struggles to a lack of understanding and engagement with the target audience. They have no real insight of how their email was received by their readers. However, feedback can be great a way of testing your uncertainties about your newsletter(s). It gives your customers a chance to share their thoughts and perceptions of your email and the information included. Was the content relevant? Was it useful? Was the promo relevant for these readers? Do your readers have suggestions on how you can improve? In the email marketing, the most commonly used metrics include click-through-rate (CTR), bounce rate, open rate and conversion rate. There is no arguing that these are useful metrics to collect, but they don’t tell you the whole story like feedback does…. Here are some tips on how to use feedback surveys in your newsletter. Keep it short and sweet. Keep the question(s) brief and to the point. 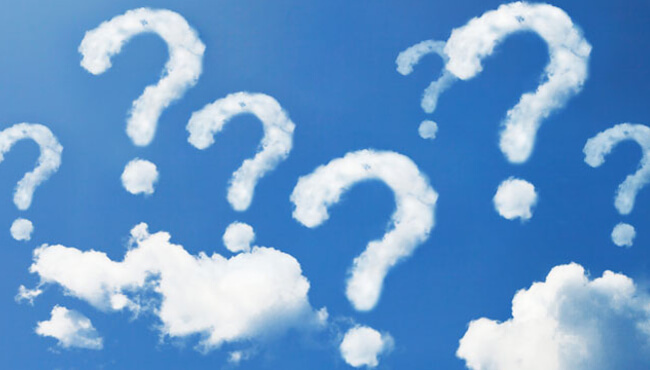 Often the more questions you ask, the less responses you’ll receive. Make sure your readers can quickly scan the text. Ask questions that meet your goal(s). You can use questions that steer your customers in the right direction in terms of the feedback you want to collect from them. Use smart, open-ended questions. If you leave your readers with the option to submit open-ended feedback, you are more likely to receive a more detailed response. 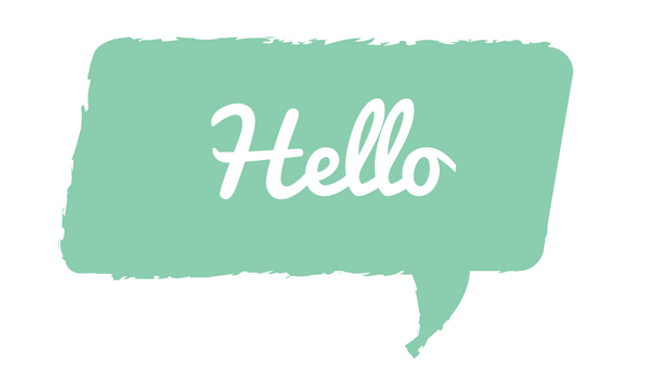 Ask feedback towards the end of your newsletter. Only once your readers have read through the newsletter are they then equipped to provide you with feedback. Use it only when you know you can act on the results. If you can demonstrate real change from the feedback you ask for, it will boost any future response rates and keep your readers engaged. That is why it’s important that you have the means to act on your feedback responses on time. Keep it simple. As previously mentioned, don’t over-complicate the process with multiple questions or questions that are too detailed. Inform readers about what you will do with their feedback. The likelihood that readers will provide you with feedback is much higher if they know why they’re providing feedback. For example, let your readers know that with their feedback you intend to improve any future newsletter(s). If your readers know it’s something that will really change for the better, they will be more likely to take the time to send the feedback. Make sure you have an effective tool in place for collecting newsletter feedback. No need for collecting and analysing your feedback by hand… Try using a software that offers built-in email feedback services. In addition to website and mobile feedback solutions, Mopinion also offers feedback for your newsletters that can be used to boost performance. Users can easily add a form to their email by copying an ‘Email Snippet’ from the platform and pasting it into their email. They can choose from score options such as Thumbs Up/Thumbs Down, Net Promoter Score (NPS) and Customer Satisfaction (CSAT) along with an open-text section. Mopinion users can create a background for their public email landing page using a webpage or HTML version of a newsletter. 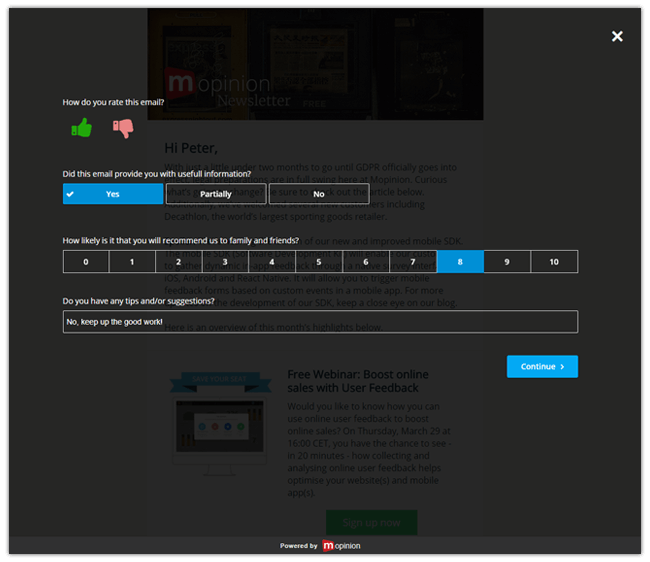 This is the page that your visitors are sent to when they are providing feedback (e.g. 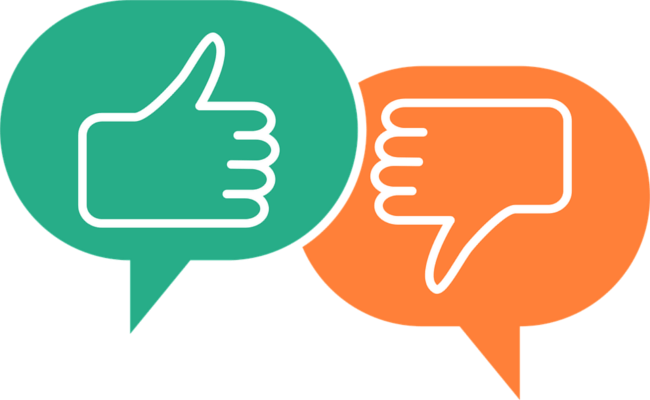 a score or thumb rating in an email). The background can now be customised in a way that makes visitors feel like they are still on your website, rather than on a landing page. When they click away from the form, they will view your newsletter or webpage as the page they’re on. Want to learn more about how our email feedback solution works? Or curious to see some examples of feedback survey templates? Check out the email campaign feedback templates in our Survey Marketplace.